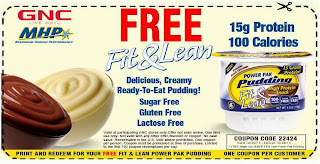 Get a FREE Fit and Lean Power Pak Pudding @ GNC. Click the link below to go to the coupon. Once you open the site print your coupon & take it to your nearest GNC to redeem. This offer expires 10/28/13.